Hello there and welcome to the start of the Clearly Besotted Teasers. Did you see Stephanie's initial sneak peeks yesterday? From now until the release on the 5th, Stephanie and the rest of the Design Team, including our fabulous Guest Designers, Rebecca Hoy and Nicole Picadura, will be sharing teasers using the new sets. My card today uses the new Simply Scrumptious stamp set and matching dies. 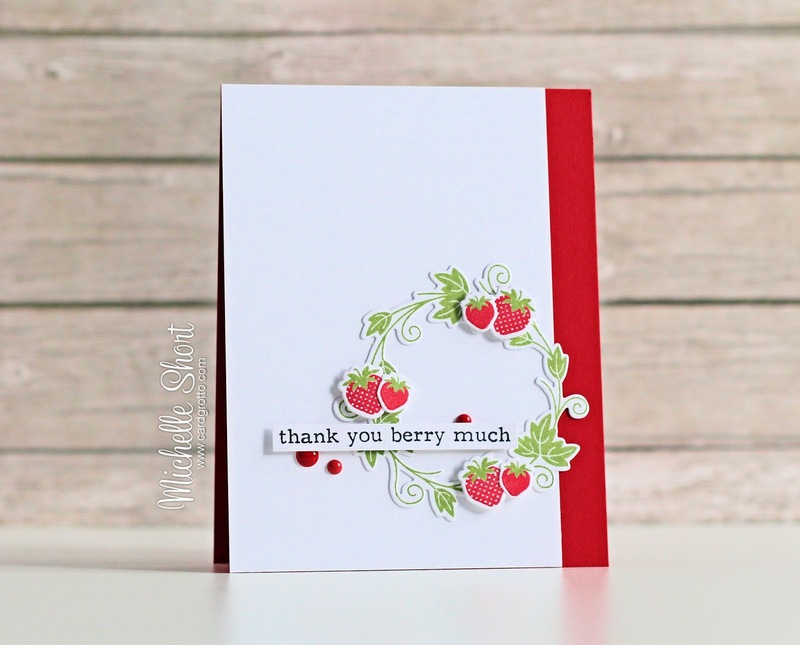 I started off my stamping the wreath in green ink, along with the strawberries in red. These were then cut out using the matching dies. The sentiment was stamped and cut out in to thin strip. I took a red A2 card base and added a layer of white cardstock to the left of it. I added the wreath on top and then the strawberries with foam tape. The sentiment strip was then added with more foam tape too. I finished off by adding clear Wink of Stella to the strawberries and a few Doodlebug Sprinkles around the sentiment. This set really is scrumptious! Please pop over to see Stephanie who will have some amazing samples to share as well as links to all the Design Team who are sharing today. Thank you for visiting me today, I will back tomorrow for my next teaser. I hope you can join me then. Love it!!! The colours are so happy! I love your style of cardmaking. Beautiful designed, Michelle! Fat and beautiful colours. Strawberries - make me feel super summery! What a sweet card, Michelle! Those strawberries look absolutely yummy! And I love the touches of sparkle and the Doodlebug accents! Super sweet card! Love strawberries! Beautiful wreath! Simply Scrumptious describes your card to a 't'! Love it...more products added to my list! Love your card, those strawberries look so yummie! I love this beautiful wreath with its bright red strawberries! And the touch of red card stock is perfection! Gorgeous card!! !